This book is a comprehensive guide that shows developers how to design and develop business processes in BPEL efficiently. Throughout the book, the authors discuss important concepts and show real-world examples covering Oracle SOA Suite 11g and related products. This book is aimed at SOA architects and developers involved in the design, implementation, and integration of composite applications and end-to-end business processes. 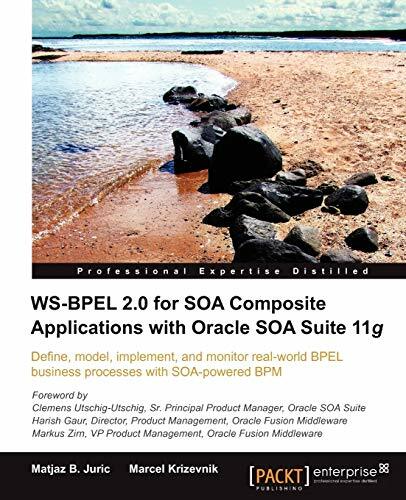 The book provides comprehensive coverage of WS-BPEL 2.0 for implementing business processes and developing SCA composite application, dealing with the issues of composition, orchestration, transactions, coordination, and security. This book uses Oracle SOA Suite 11g and related Oracle products. To follow this book you need to have basic knowledge of XML, web services, and Java EE. Matjaz B. Juric holds a Ph.D. in computer and information science. He is Full Professor at the university and head of the Cloud Computing and SOA Competence Centre. Matjaz is Java Champion and Oracle ACE Director. He has more than 15 years of work experience. He has authored/coauthored Business Process Driven SOA using BPMN and BPEL, Business Process Execution Language for Web Services (English and French editions), BPEL Cookbook: Best Practices for SOA-based integration and composite applications development (award for best SOA book in 2007 by SOA World Journal), SOA Approach to Integration, Professional J2EE EAI, Professional EJB, J2EE Design Patterns Applied, and .NET Serialization Handbook. He has published chapters in More Java Gems (Cambridge University Press) and in Technology Supporting Business Solutions (Nova Science Publishers). He has also published in journals and magazines, such as SOA World Journal, Web Services Journal, Java Developer's Journal, Java Report, Java World, eai Journal, theserverside.com, OTN, ACM journals, and presented at conferences such as OOPSLA, Java Development, XML Europe, OOW, SCI, and others. He is a reviewer, program committee member, and conference organizer. Matjaz has been involved in several large-scale projects. In cooperation with IBM Java Technology Centre, he worked on performance analysis and optimization of RMI-IIOP, integral part of the Java platform. Matjaz is also a member of the BPEL Advisory Board. Marcel Krizevnik is a researcher at the University of Maribor where he is preparing a Ph.D. in computer and information science. Marcel started his career as a software developer of chemistry information systems. Now, his main research areas are service-oriented architecture and cloud computing. He is also a member of SOA Competency Center and Cloud Computing Center. In the last three years, he has been involved in several SOA technology projects.